New volleyball rules for 2018 USA volleyball season. It's always a good idea to review the new rules for the current volleyball season. Knowing the rules for your sport is important because if you don't understand the rules, you can end up having a very frustrating experience. So whether you are a coach, player, parent, or referee know the rules! Click on the following images to get a closer look. The players not in play should either sit on their team bench or be in their warm-up area. 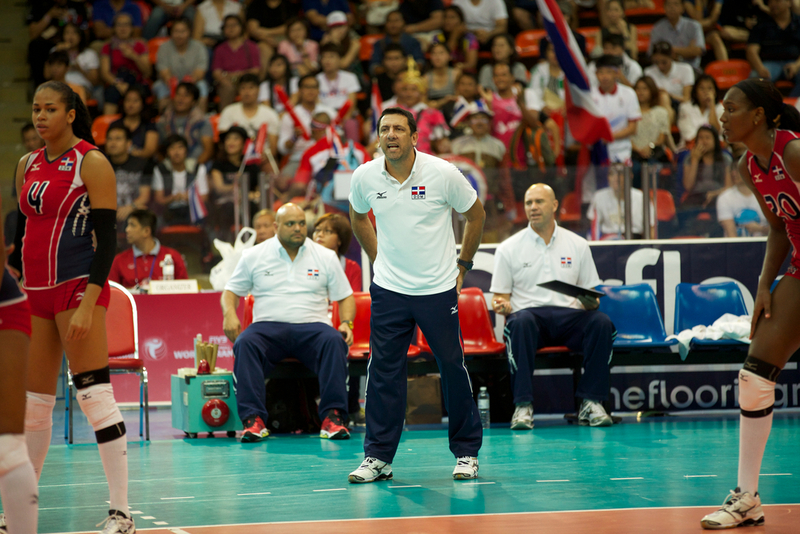 The coach and other team members sit on the bench, but may temporarily leave it. So, it’s the head coach, not the assistant coach that interacts with the R2 during the match. And only one assistant may stand during play. This is just for adult competition. For junior competition, when one team has exclusive use of the court, the other team must either be at its team bench or out of the playing area. Warming up with balls at the team bench or in the spectator walkways is not permitted. So here, we are reverting back to the old way. If the opponent has served, then you don’t take away the points. If the team is still serving and the positional fault is discovered, then take away all the points that were scored while being out of position. So this means the captain may request a substitution or timeout. It is the R1’s judgement to whether or not the jersey is contrasting. This is true except for when the player contacts the net after the play has ended. For example, if the hitter hits the ball and the hitter makes contact with the net after the ball hits the court (hitter makes contact with the net during the follow through). In this case, the ball is ruled down first and there isn’t a net violation. 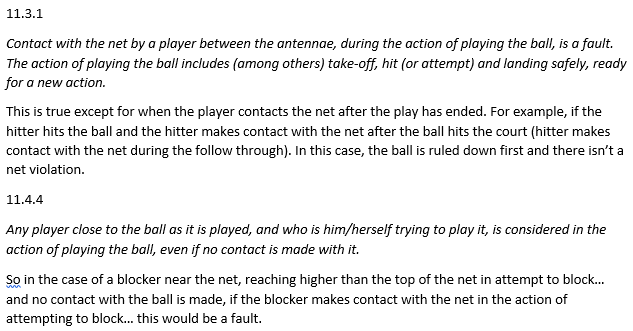 So, in the case of a blocker near the net, reaching higher than the top of the net in attempt to block… and no contact with the ball is made, if the blocker makes contact with the net in the action of attempting to block… this would be a fault.